You will love this easy, breezy Chinese Noodle Bowl Recipe and it’s ready in a heartbeat. We have a video tutorial to show you how. Be sure to check out all the details now. Looking for a quick-fix dinner tonight, then this Chinese Noodle Bowl Recipe is the ticket. It’s quick and takes little prep time. You can use fresh or pre-made stir-fry vegetable mix for this recipe and your favorite stir-fry sauce. One thing’s for sure it packs a delicious flavor filled punch that you will love. This RecipeLion video shows you how a simple and quick meal made at home can be just as good as your favorite Asian restaurant. You only need frozen veggies, stir-fry sauce, and a few other small ingredients to make the magic happen. Start by cooking your noodles according to the package directions. Drain and set them aside for now. Heat up your Wok and put the California stir fry veggie mix in, along with some oil to keep it from sticking. Add the corn and bamboo shoots. Lightly toss everything to combine. Pour in 1/2 cup water and your stir-fry sauce. Simmer over medium heat until your veggies are soft. Add your cooked noodles, garnish with some green onions and toss everything to combine. 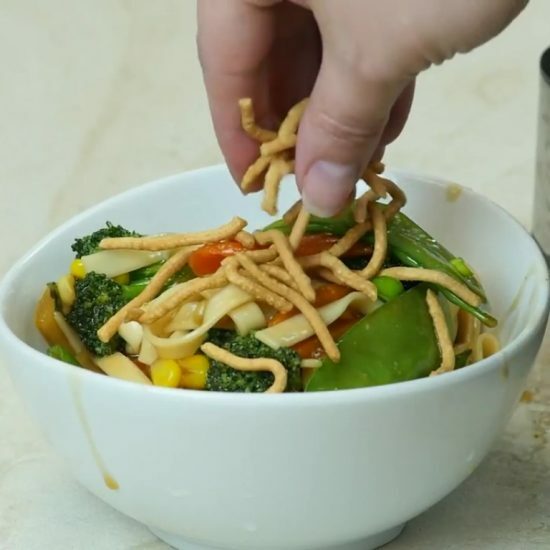 Serve your stir-fry and top with Chow Mien noodles, if desired for an added crunch.